Jesus declared, “I will build my Church,” to his small band of disciples after Peter confessed him as the Christ. In one pithy pronouncement, Jesus defined both his role in and his ownership of this enormous and supernatural construction project. In the early twentieth century, Lutheran Brethren missionaries J.I. and Sophie Kaardahl must have wondered what this Church would look like as they labored in the heat, obscurity, and isolation of southwestern Chad to bring Jesus’ gospel to the Mundang people. Ralph and Esther Fuglestad, arriving to relieve them, must have had similar thoughts. Had the newlyweds wondered that just one Chadian boy had come to faith in the first eleven years of the Kaardahl ministry? I can only imagine Ralph’s joy during his first dry season in Chad when he and Berge Revne (coming from Yagoua, Cameroon) ventured out together to preach to a neighboring Masana tribe. Who could have predicted it would be two witch doctors responding to the gospel message that day? This joy must have been a comfort when, barely a year after his arrival, Ralph lay sick in bed, eventually succumbing to a severe complication of malaria. The death of this patient, godly man saw an outpouring of sympathy from the villagers toward Esther through the shared experience of suffering and death. She prayed that Ralph’s death would “lead many souls… to Jesus.”1 Years later, the Mundang still referred to her as the “lady of the courageous heart.” Could Esther have imagined at the time that this people group would one day grow into the strongest element of this new Church in Africa, sending their own missionaries to other tribes? Years and countless similar stories later, the seminary in Gouna Gaya was in need of a missionary couple to help train Chadian leaders. Paul and Teresa S. answered God’s call to Chad. 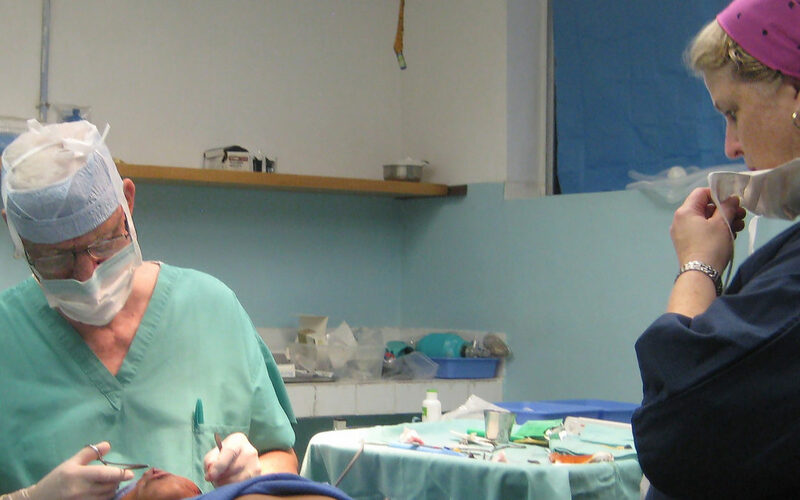 While in Gouna Gaya, Paul and Teresa would occasionally slip across the border to a mission hospital in Meskine, Cameroon, seeking help for an occasional medical problem or attendance at childbirth. There they met Bert and Debbie O., a medical missionary couple involved in the beginnings of the hospital. I first met Paul and Teresa in Fergus Falls, Minnesota when my wife Trisch and I were delegates to the CLB national convention and Paul and Teresa were featured speakers. Hearing of the short-term mission trips we had been leading in partnership with the Lutheran Brethren of Cameroon, and aware of our medical backgrounds, Paul advised us to connect with Dr. O., as he had become aware that a new medical project was underway in Chad. Since the opening of the mission hospital seven years ago, we have journeyed there once or twice a year with small groups from Maple Park LBC (Lynnwood, WA) helping to guide, fund, and encourage the work there. Growing quickly as it met desperate needs for medical, surgical, and obstetric care, the hospital became known in the surrounding areas as the place “where you can have a baby and the mother does not die.” In addition to bringing hope and health to the Chadians, the hospital serves the medical and surgical needs of mission workers of various denominations and associations. Bible verses are written on the hospital walls and a Chadian chaplain visits and prays with the patients daily. The staff are encouraged to share the gospel with patients as the spirit leads. Along the way, ZamZam and Jonathan R., who had been living in a neighboring village, founded a thriving school on the hospital grounds. Jonathan, the son of LBIM missionaries to Chad, had married ZamZam, a Chadian Muslim background believer, who had come to faith after reading a Gideon Bible. The school also grew quickly despite the inclusion of Bible teaching in the curriculum. It has become known for its excellence, serving over 600 students through the sixth grade. Last year, the hospital leadership was approached by two Chadian men who proposed to meet for Christian worship on Sundays using the school building. Before long, a congregation of believers had assembled and attendance grew. God is being praised in open worship now and his Word is being openly taught weekly in the midst of these people groups. God is expanding his kingdom through his Church in a highly visible way over three hundred kilometers north of the original CLB mission in Lere, Chad. We later discovered that these two men had been trained by the Paul and Teresa in Gouna Gaya. More recently, after hearing Dr O.’s numerous gospel presentations, a prominent and influential village chief has professed his faith in Jesus. Could this chief be a “person of peace” described by Jesus in Luke 10:6? I can only imagine the opposition this man will face from his fellow village chiefs and Imams in the area when news of his confession spreads. Please pray for him and his family that God will hold them fast to the promise of the gospel in the face of unimaginable opposition. Connecting the dots in this abridged and convoluted tale, the stories testify to the genesis, nature, and composition of this supernatural Church of which Jesus spoke: It is Jesus who builds it and who is the owner. We who—past, present, and future—are called to join him in his Church’s mission to make disciples are the “living stones… being built into a spiritual house.”3 We rest in the assurance that we have become part of God’s master plan to bless all nations. Dr. Johnson practices Pulmonary Medicine in the Seattle area where he lives with his wife Trisch. Dr. Johnson currently serves on the board of directors for the mission hospital in Chad and as medical advisor to the LBIM to Chad. The Johnsons attend Maple Park LB Church in Lynnwood, WA.